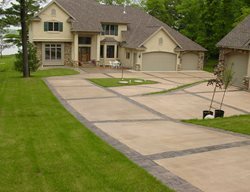 Concrete Driveway Projects: Submitted by driveway contractors across the U.S. 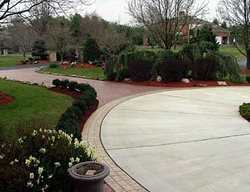 This existing driveway was transformed with color and engraved patterns, including seven brick circles. This driveway was colored and patterned to match the stone on the house and the color of the garage door. Old english brick running bond approach with yorkstone parking area. Get this look using silver pigment integral coloring, charcoal powdered release, and a European cobblestone pattern. 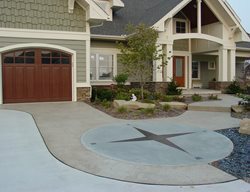 This residential colored driveway was stained in an auburn color. The diagonal strip across the driveway was sandblasted to bring out the aggregate and add interest to the surface. This driveway was scored and stained with Black and diluted Black. Get this look using a York stone stamp, brick border stamps, and a slate gray color. RadonSeal's LastiSeal was used on this driveway after finding that solvent based sealers were subject to extreme UV degradation. Color Cap Concrete Coatings, Inc.
Get this look using an old granite seamless cleft stone pattern, from Proline Tools, Brickform color hardener in pecos, and Brickform release agent in walnut. Kemiko ‘Black’ acid-stain gives this 10,000 square foot residential drive and parking area its durable, etched-in color base. 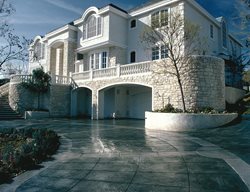 The final appearance is enhanced with multiple applications of a custom ebony-tinted exterior sealer. Exposed aggregate driveway with banded edges. This large concrete driveway was resurfaced to create the look of faux flagstone. It includes a raised “M” logo in the driveway as well. 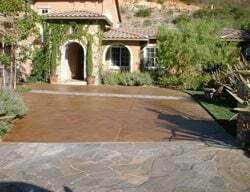 On a 2,500 square foot concrete driveway makeover in Bel-Air, Calif., Glen Roman of Staintec used Newlook products to tie all the concrete and overlayment together with color. Get this look using summer sand to color the bands, light wheat for the stamped fields, summer sand enhancer and a water-based sealer. This driveway in Barton Creek Lakeside is Dark Walnut. Great description of creative approach to constructing the concrete landscape. Innovative technique and effective result. Great overall concept. 2008 Cemstone® Residential Exterior First Prize - Hiew Residence. The concrete patterns and colors set apart the vehicular and pedestrial uses. Scoring is consistent and works its way through the different colors and patterns in a clean and professional way. Ashlar slate pattern and colors compliment the house’s brick. Plain gray concrete doesn’t have to be boring. 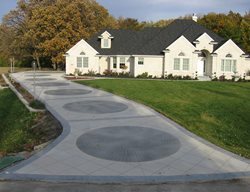 This residential driveway in Plum, PA was enlivened with a swirl pattern and large control joint squares to add interest and dimension. 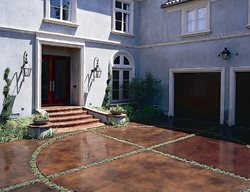 This new poured residential concrete driveway features a swirl finish. The 18” border around the driveway was poured and finished with exposed aggregate. This job was located in Peters Township, Pittsburgh, PA. 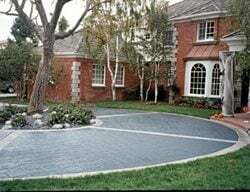 This residential stamped concrete driveway was beautified using a pigmented densifier to create a non toxic and non hazardous surface. 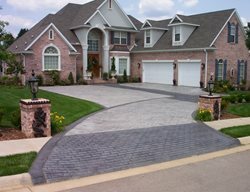 This St. Louis driveway was stamped with a Euro stamp border and a slate texture mat. The colors used were pewter and a charcoal grey release. 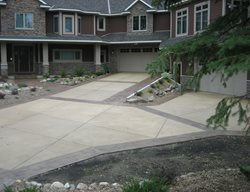 This residential driveway is a concrete overlay that has been textured and stained with water based stains. 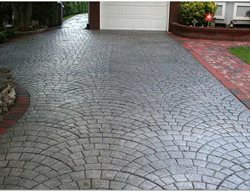 This is a residential driveway that was overlayed on an existing concrete surface, stamped with a textured pattern and saw cut with a border and diamond pattern. 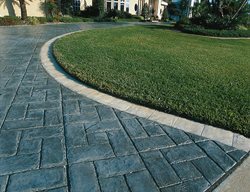 This driveway was created using a gray sprayed on texture over an ashlar slate stencil. The diamond shapes were fashioned using the same stencil turned at an angle and colored red. 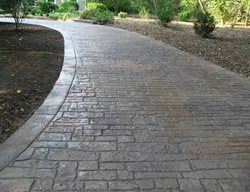 A burgundy textured border was sprayed on around the driveway. This driveway was stamped with a herring bone brick pattern. The whole project was 13,000 square feet of concrete. Read more about how this driveway was created. This residential driveway was colored with pewter and highlights added with a medium grey. The pattern used was a large ashlar slate stamp set at a 45 degree angle. 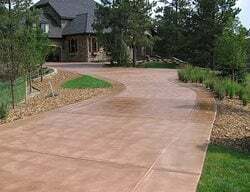 This random stone patterned residential concrete driveway was created using stamped concrete and colored with Victorian red hardener and basalt release agent. Scored and stained concrete drive in commercial shopping area. Used Butterfield's Elements stain and sealed with Coloration Systems product. Existing concrete driveway stained to look like leather and garage door faux painted to look like rustic wood. Get this look using Super-Krete's water-based stains in walnut, black, yellow and terra cotta. 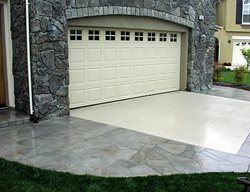 Read about how this driveway and garage were created. DecoCrete by Weaver Concrete Specialties, Inc.